Busy south shore dealership receives all 10’s in customer surveys from 650 new and used sales while competing with 59 other Northeast dealerships. (L to R): Security DCJR Client Relations Manager Natalie Jenkins, General Sales Manager John LaFrancesca. 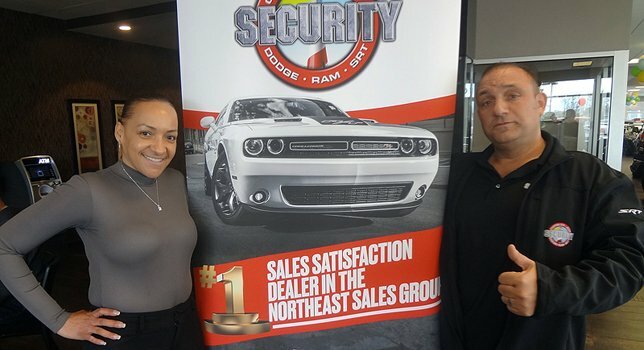 Amityville, NY – April 25, 2017 - For Security Dodge Chrysler Jeep Ram (DCJR) of Amityville, the number one DCJR dealership on Long Island, hitting numerous milestones has become 'just another part' of their day-to-day routine. With that said, when the folks at Security feel the need to highlight a specific achievement in particular, you know it has to be a big deal and in this case, it most certainly is. For the first time ever, Security DCJR has been voted as the #1 dealer in terms of Sales Satisfaction in the Northeast Sales Group by parent company Fiat Chrysler Automobiles, according to Client Relations Manager Natalie Jenkins. The survey covers numerous categories, including overall customer satisfaction, dealer advocacy, if the customer would recommend the dealership to family and friends, how their sales person was, and more; all categories are graded on a scale from ‘1’ to ’10’, with ‘10’ being best. Competition in the Fiat Chrysler Northeast Sales Group for the coveted #1 in customer Sales Satisfaction award is fierce, as there are a total of 59 dealerships in that group. However, Jenkins noted that Security DCJR has always maintained the highest standards when it comes to treating and interacting with their customer base; this reward, she said, represents that the busy Amityville dealership’s approach to customer service, always highly regarded, is among the very best in the field. Security DCJR’s attainment of this award is especially impressive given that they are a ‘Class E’ dealership, which is among the very highest of volume designations for a dealership. For example, in the month of March, 2017 – the time period for which they won the sales satisfaction award from Fiat Chrysler – Security DCJR sold 650 cars; an amazing number that certainly allows the possibility for at least one or two negative customer experiences to creep in. However, General Sales Manager John LaFrancesca noted that Security DCJR customer satisfaction scores for March 2017 were perfect; in other words, everyone that filled out a follow-up assigned the dealership a ‘10’ in and every category, and for a high-volume dealership, truly a noteworthy feat. Maintaining a high standard of customer service is especially vital in this day and age, LaFrancesca noted, with the Internet providing people a way to make their voices heard far and wide on their experience with any given business in a way that's never been possible before. At any given time, Security DCJR has approximately 1500 cars in inventory, spread out between their Amityville dealership and three other lots, giving them arguably the largest selection of cars out of any dealership on Long Island. With that selection and the dealership’s strict adherence to customer service – not to mention an ever-present goal to constantly improve each and every day – Jenkins noted that winning the March 2017 Northeast Dealership Sales Satisfaction award is a nice payoff for all of the Security DCJR team’s collective hard work. Subject: LongIsland.com - Your Name sent you Article details of "Security Dodge Chrysler Jeep Ram of Amityville Takes #1 In Customer Satisfaction for March 2017"